The Trainer Snippets report shows that Keith Dalgliesh has a useful record with runners turning out again within seven days of his last race. From his last 192 such runners, he's had 35 winners (18.23%) and 80 places (41.67%), for level stakes profits of 26.41 and 18.12 respectively and an Impact Value of 1.30. He runs New Abbey Angel at Wolverhampton today in a nine-furlong handicap and he was last seen six days ago. New Abbey Angel has been running consistently without getting his head in front. From his last six races, he has been placed four times, with all of those runs coming here at Wolverhampton. He was slowly away last time out over course and distance which killed any chance of winning the race and I am hoping that racing again so soon has the desired effect and he can get that elusive win. He is four pounds lower than for his only win to date, therefore, if he can produce his best form he has a chance. Connor Beasley takes the ride today and he has a good long-term record riding here at Wolverhampton. Over the past five years, he's had 27 winners (13.30%) for a level stakes profit of 15.71 and an Impact Value of 1.18. The Instant Expert report suggests that this is quite a poor race that will not take a lot of winning, as when on the 'Place' setting there are just two sections of green between the whole field. One of those green sections belongs to New Abbey Angel (Course) and he also has four sections of amber, meaning he is really well suited to today's conditions. When looking at the Pace report we can see that prominent runners have the best record, but it isn't a huge bias and this section has produced a large overall level stakes loss. New Abbey Angel is usually held up and as long as he can get away on level terms today then I think he has a chance of picking them off inside the final furlong and is currently priced around 7/2. 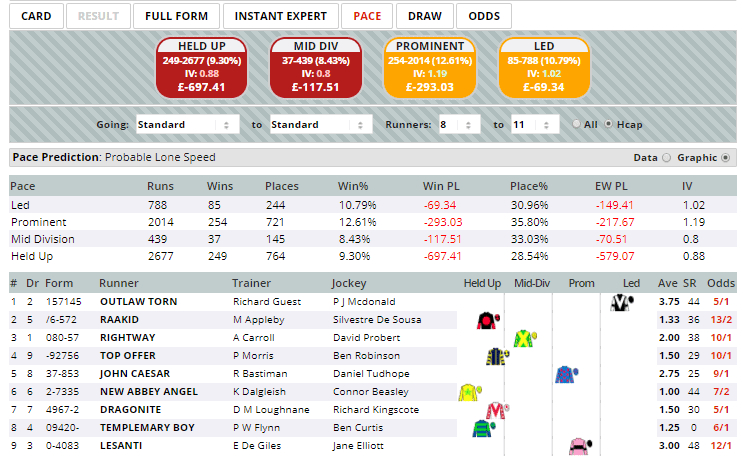 Click here for the 16:25 at Wolverhampton.